As a Canadian I obviously love the game of Hockey. It’s probably the first sport I can remember watching. However, I have never been a supporter of the fighting. It’s not tolerated in recreational hockey, so how is it professionally a part of the game. I mean really, the object of the game is to score a goal! I’ve yet to watch a NHL game where a fight doesn’t break out. And the worst part is fans actually cheer and encourage it. Really, now? We’ve had numerous cases of fights leading to serious injuries, the most recent being the death of Don Sanderson, a defenceman with the OHL Whitby Dunlops, on January 3, 2009! When I was in University, I remember a year where 3 deaths in wrestling at various universities had occurred – one of which was a classmate and friend of mine, Jeff Resse. He had been attempting to cut 22lbs over four days to compete in a lower weight class when his heart failed. Unfortunately, it took 3 young men dying for the NCAA to change the rules regarding “making weight.” I can’t help wondering if we are going down the same path with Hockey? And while many people may argue fighting has always been a part of the game, we should also remember there was a time when players played without helmets and goalies without facemask… but at some point changes were necessary. 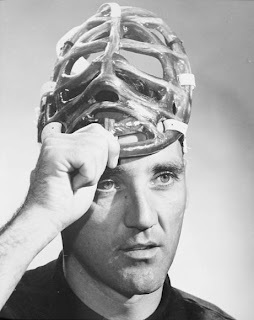 Jaques Plante the first goalie to ever wear a face mask, refused to return to the ice without face protection after breaking his skull, cheekbones, nose and jaw. Maybe we ca learn from Jacques Plante or wrestling when it comes to fighting and hockey. What a concept?